What is so “Good” about Friday? As I sat this morning in the quiet of the living room reading, meditating and reflecting on the season of Easter I had several thoughts come to mind.I read through the accounts of Good Friday in each of the Gospels. Each one offering slightly different details of the events of the fateful morning of Jesus’ crucifixion. What follows are my some of those thoughts. First off, it was under the cover of darkness that Jesus was taken into custody. The dark is often a scary place to be. We can feel alone and afraid as we stumble along in the dark. Evil deeds are often committed in the dark of night. Darkness came first it was God who said, Let there be Light. For Christ’s followers the Joy comes in the morning, in this case Easter morning, when we celebrate the Resurrection. The holy men of the time took Jesus to Pilate for trial and conviction. The charge, “he is stirring up the people with his teaching.” Luke 23:5. Really? The leaders of the time were so entrenched with their “traditions” they could not see or hear their God who was standing in the flesh speaking to them. I think that this happens to us today. We can become “stuck” unable to move into the new place or thing that we are being called into, unable to leave the safety of the comfortable nest that surrounds us, unable or willing to venture into a new place. Jesus did not endure death on the Cross so that we could be comfortable. He died so that we may live. He came to seek and to save the lost. Luke 19:10 And when He died this responsibility was passed onto us. We have become his change agents. The religious men of Jesus’ time missed the boat. They were afraid of the change. They thought that their king would look different. So they killed him. The crowd chanted and raged, “Crucify him”, over and over until Pilate turned him over and released a known murderer. They beat him bloody, dragged him, spit on him, tortured him, made him carry is own cross through the streets up the hill where he would have spikes(not nails) drove through his wrists and feet, hoisted up causing jolting of his body, and left to hang for all to see. Does this make you uncomfortable? Can you imagine the pain? 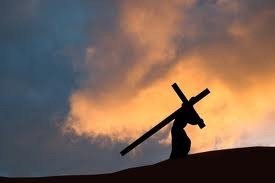 Jesus endured the cross for us. So that our despicable sinful way could be made right and we could be reunited with God sharing in His glory forever in eternity. This my friends is the Good News. No watered down version here. No soft selling. No lukewarm temperature. This is truth. Whether you like it or not doesn’t change it. As the world remembers and grieves the tragic events of a decade ago I wanted to compete with the images our brain absorbs. This Guatemalan child was not born in 2001. Her future holds promise and uncertainty in a country that struggles with drug traffic and poverty. Yet here she is on her knees before the Throne of the Almighty God, Creator of all, our Comforter and refuge.